Located in a building of Nice, 2 steps from the tram and all means of transport (bus route to Menton and Monaco Place Garibaldi 1 min) train station at 4 tram stops. 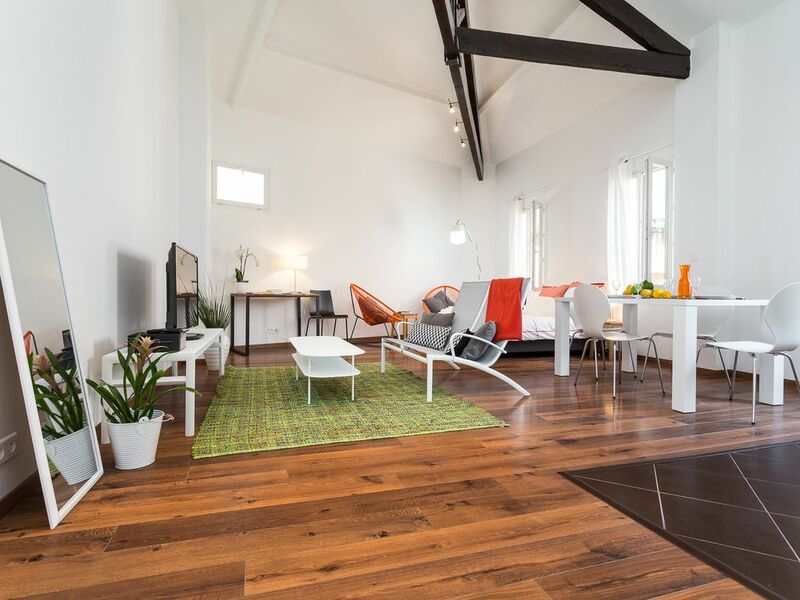 Wonderful modern loft in great location near Old Town, Nice! I'd would love to return anytime. This beautiful loft was perfect. I only stayed a few days at the beginning and at the end of a longer trip.... but wish I could have stayed longer. It's a hidden treasure on a quiet street just steps away from everything in Nice. LOVED it. Dirty apartment, disgusting pillows, bad smell,the entrance door is of poor quality(broken and unsafe), bad view, noisy(near are construction works). I don't recommend this flat. Ms. Sachot did everything we needed in Nice. The apatment also has everything we need. It is furnichured very tastfully. We surely come back again! We stayed in nice a very short amount of time and due to weather issues, didn't get to explore the city much - but what a perfect studio to be stuck in! Open and airy, spacious and neat - we had a great day just relaxing and enjoying the last day of our honeymoon. Catherine was great to work with and was very nice to us even though we lost all internet and phone call abilities about an hour before we were supposed to meet (which made it so we were lost, without our directions, and couldn't let Catherine know how late we were going to be because of it all). I highly recommend this studio for its location and for its incredible beauty and amenities!! Location is also great and we ventured out a few times and didn't have to go very far at all to find restaurants and shops and sites and necessities we needed! For those traveling with a car, there is some construction on the street leading to the street of the apartment and as such, we had a really hard time navigating to the area. Gps and google maps was of no help at all as the directions the service had us use brought us to one way streets in the wrong direction or streets that were closed. In the end, we had to do a not terribly legal move (we think - hard to say) to get on the street because of the closures (we took a turn on to a street that looked to be only for taxis but you are on the street for a block or two at most). Parking would also be pretty difficult (this goes for nice in general - that has nothing to do with the apartment) so we put the car in a lot very close by and just left it there. Signs were hard to make out for us foreigners so didn't know where and when we were allowed to park on the street. Also if you are traveling with a lot of luggage, be aware as this is a walk up and our heavy wine and souvenir filled bags were not so fun to bring up especially with the parking issues etc. once we had all the bags upstairs though, the walk up is not an issue AT ALL and frankly it was great to be on the top floor looking out at all the bistro tables and the adorable character of the neighborhood! We would 100% stay here again and highly recommend the apartment to anyone who is interested!!! Super schönes Loft und nette Besitzerin! Die Besitzerin dieses tollen Lofts war super nett! Die Wohnung ist sehr schön eingerichtet und hat alles, was man braucht. Einzig die Parkplatz-Suche ist ein kleines Problem, hat aber mit der Wohnung ja im Allgemeinen nichts zu tun. Würde auf jeden Fall nochmal dort übernachten. Ho soggiornato qui con il mio ragazzo per quattro giorni. Il Loft è estremamente carino,l' arredo moderno e funzionale, la posizione è centralissima. La proprietaria è stata molto gentile nonostante il nostro ritardo. Quattro giorni fantastici!